So, you’re in a situation where you may be a less than perfect mother. I only know of one perfect mother, and after all, her Son was perfect, too. The rest of us are all less than perfect mothers. We don’t always know what we’re doing, we’re not always the models of patience and joyful motherhood we’d like to be, we’re sometimes tired or frustrated or at our wits’ ends with our little (and not so little) bundles of joy. None of us is capable of doing this alone–and to the extent that some of us may really promote the idea of celibacy before marriage, it’s because we know from our own experiences that it’s not an accident that parents come in sets of two. But just because you didn’t live up to that ideal doesn’t mean it’s our business to scold (that’s between you and God, and perhaps your pastor or spiritual adviser if you have one). We also know that it takes two to tango, and that the man who participated in the creation of this baby has plenty to answer for. Society makes it much easier for him–and then society holds out the evil of abortion to you as if it’s something good, something that lets you, too, walk away from this baby and pretend she never existed. You know better, and many post-abortive women will tell you that you never forget her existence, or the day you let them kill her. So we do want you to choose life for your baby, because we think that you, as a woman, deserve better than the false promise of abortion. You deserve better than being told to deny your very nature and shut off all compassion for the little one you may have had a name for years ago, when you dreamed of starting a family. Your dreams may have been different, but then our dreams and our realities aren’t usually a perfect match. It’s okay to be less than perfect in this; you know that life also tends to get better than we ever think it will in our darkest hours. Maybe you already know you want this baby to live; you just haven’t figured out the “hows.” How will you finish school? How will you keep working? How will you arrange your life, in the face of this new reality? How will you ponder adoption, or know if giving up your baby to a loving couple is the right decision? We have a “how” for you, too, and it’s this: How can we help? Can we help you with insurance and doctor appointments? Can we help you approach your employer to adjust your hours or the type of work you’re doing? Can we help you find someone to be there for your birthing classes who will be with you when you go into the hospital to deliver this baby? Can we provide counseling? Can we arrange for you to meet with people qualified to help you consider raising the baby yourself vs. placing her for adoption? Do you need a place to live? Do you need basic things like food, maternity clothing, and supplies for the baby? I know that many crisis pregnancy centers can provide access to all of these services and more. The diocese where I live offers the Gabriel Project, which includes many services directly to women in crisis pregnancies, as well as referrals to crisis pregnancy centers in the diocese. 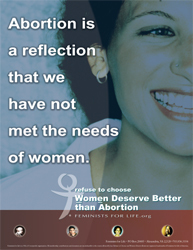 As we mark the 39th anniversary of Roe v. Wade and mourn the deaths of fifty-three million American children, let’s realize that abortion is horrible for women, that it is destructive, that it is dehumanizing, and that it is the last thing women need in order to be equal to men–in fact, it’s downright insulting to women to say that we need abortion in order to fulfill our dreams. Read the whole post here. This entry was posted in Abortion, Catholic Moral Teaching, Pro life. Bookmark the permalink. Christian “crisis pregnancy centers” are a joke. They are rude and condescending to the young women who are not informed enough to go to Planned Parenthood. There are usually no trained medical personnel, they just give over the counter pregnancy tests and try to make the young lady feel as though she is some sort of a whore. How do I know this? My (now 20 something) daughter went in there one time and that is what happened to her. She wasn’t pregnant, she just wanted to see what happened.